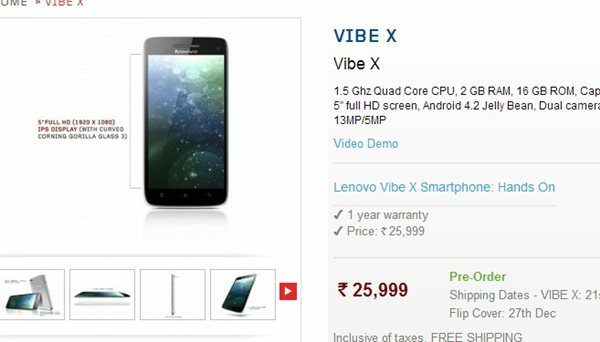 To attract the smartphone lovers, Lenovo has launched it’s best Smartphone Vibe X with Quad Core processor and Android 4.2 Jelly Bean priced at Rs. 25,999 in India in Silver colors option. This Ultralight, Ultra stylish, Lightest 5″ full HD premium smartphone will be available in Indian Market by end of this week now available for pre-order at Rs 25,999. It will give stiff competition to Apple iPhone 4. The Lenovo Vibe X is powered by a 1.5Ghz Quad Core Processor with 2GB RAM and 16GB ROM comes with a 5″ Full HD display with Gorilla Glass 3 runs on Android 4.2 Jelly Bean OS sporting a 13 MP auto-focus with LED flash rear camera and 5MP front camera packed with a 2000 mAh (Li-polymer) battery. At last I would like to say that new Lenovo Vibe X hidden tones of features to take high end smartphones like Apple and Samsung. What you think? Please be first to right a review.